Can we just take a moment and talk about how thankful I am that the athleisure trend has made it completely acceptable – even stylish – to wear leggings and sneakers and still look put together? I’m sure all of you will agree, being a mom is not easy! From the car pool line to errands to cleaning up the same toys 500 times a day, making sure everyone in the house is dressed, fed and on time every day … some days there’s just not enough time to even wash your hair (I know I’m not the only one that goes for days on dry shampoo), let alone plan out what you’re going to wear for the day! Thankfully for us, the athleisure trend is continuing to grow, and we have so many options for comfortable, functional and stylish clothes and shoes in fun new prints, textures and colors (have you seen the sneakers with rose gold detail?!). Speaking of good shoes, Off Broadway Shoe Warehouse is my go-to for a good pair of stylish sneakers! I like to have lots of different gym shoes to match all of my fun printed leggings, so I need a place with a lot of good options. They have styles for the whole family, and great prices are always a plus! 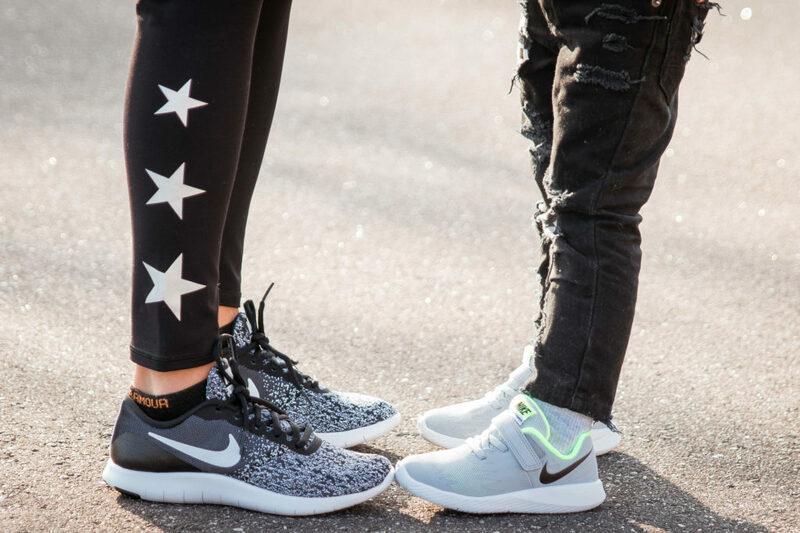 You can’t go wrong with a great pair of Nikes (I’m wearing the Nike Flex Contact) when you’re running errands all day, and I love to put Brexton in them too for traction when he is off and running (Brex is wearing the Nike Star Runner)! Off Broadway also carries Vans, which are Kyle’s and Brexton’s go-to daily shoe! Don’t get me wrong, I still love dressing up whenever I can and slipping on my heels for a night out with my hubby – but when it comes to every day wear, athleisure is the way to go! It really works for me because I can work out in the morning and then just throw on a different top and not look like a hot mess. And it’s comfy when I am running around Brexton’s gym class or lugging him through the grocery store. Mama needs some high-waist leggings and sturdy shoes, am I right?! So for all of you mommies out there, put the kids to bed, grab a glass of wine and have some retail therapy at Off Broadway Shoe Warehouse. They currently have a Buy One, Get One 50% off sale … and you deserve it! 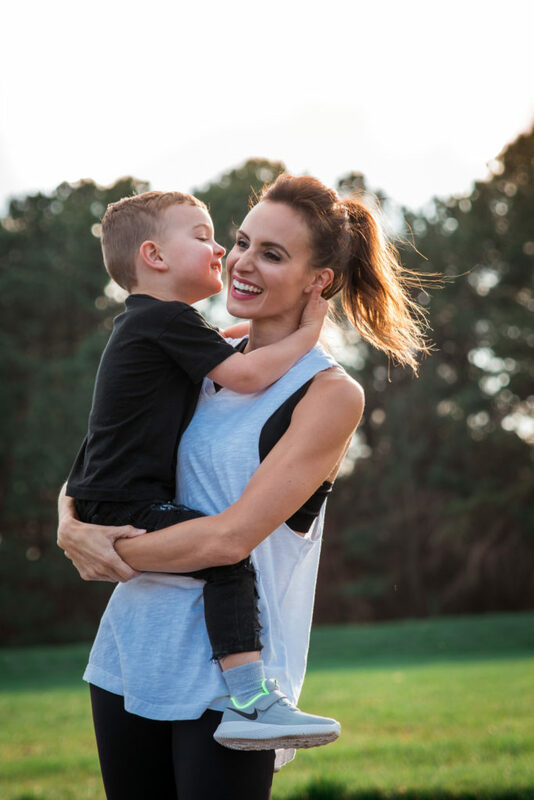 Plus, head over to my Instagram page (@samanthabusch) for a chance to win a $50 gift card from Off Broadway Shoe Warehouse! Thank you to Off Broadway Shoe Warehouse for sponsoring this post. All opinions are my own.